Power Washing is recommended for hardened surfaces that can take the higher pressure of water. Power Washing is different than Pressure Washing in that lower pressures at higher volumes are used in combination with various chemicals that pre-treat the surface so that less aggression is needed to achieve the desired clean. 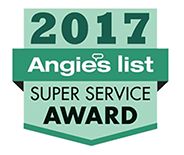 This system is perfect for restoration cleanings on Siding, Patio & Deck Cleaning, Sidewalk Cleaning, Paver Cleaning and Fence Cleaning. Call Softwash Ranger and ask about our affordable power washing services for your property today! 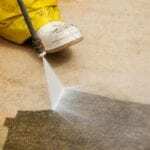 When a surface has been neglected for a long period of time and a heavy build up of soil, environmental fall-out, mold, mildew, fungus or even UV damage like oxidation is present, you just may need to get aggressive. Power Washing is great for stripping a surface back down to its most basic elements so that the surface can be painted, sealed, have maintenance done or just begin a new life cycle. Power Washing in the hands of a professional is one tool for cleaning and bringing a surface back up to par. It however is too aggressive for regular maintenance cleanings. Surfaces that are merely surface stained with soil, dust, mildew, algae, bacteria and bugs nest done need the blowing and blasting of pressure washing or even power washing. That is where SoftWash Systems softwashing technology and chemicals come in. 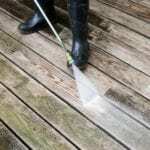 Softwashing is the process of which an agricultural style sprayer (much like a pest control company) is used to apply gentile, biodegradable chemicals to a surface in which the chemicals do all of the cleaning and NO pressure washing is needed. Once the chemicals are allowed to dwell on the surface for a period of about ten minutes the chemicals and now emulsified dirt and such easily rinsed away with a simple garden hose. This is the gentlest way of doing maintenance cleanings on building surfaces without impacting the service life of the building product. Softwashing uses safe biodegradable chemicals, saves water, uses no fossil fuels and lasts 4 to 6 times longer than traditional pressure washing. Softwashing with this SoftWash Systems Authorized Professional helps you reduce your waste and be a better steward of this beautiful earth we have been blessed with. When it comes to maintaining your North New Jersey home’s siding, there are a few different ways you can keep the exterior of your home clean. 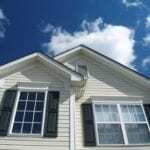 Siding Cleaning is a cost efficient and fast way to improve your home or office. We can keep it clean and presentable with our pressure washing services at Softwash Ranger. Our Patio & Deck Cleaning Service is the perfect solution for getting dirty decks and patios clean and clear of years of accumulated grime. We can remove years of wear & tear and bring new life back into older decks and patios. 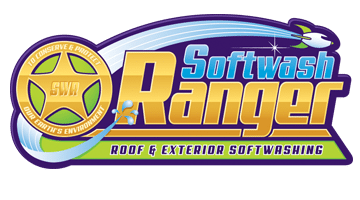 For effective, efficient, affordable, and safe cleaning solutions, call Softwash Ranger power washing experts today. Most people do not realize how dirty their concrete driveways and sidewalks can be. 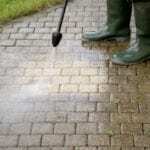 Many are amazed with the difference that our Sidewalk Cleaning Services can provide. We remove years of build up and stains in just a short amount of time. Call Softwash Ranger for more details. Pavers are the decorative stone work that is involved with many patios and walkways. Keeping your pavers clean will increase the natural beauty of the stones and reduce the ability of grass and weeds from growing in the cracks. If you want to see your pavers look like they were just installed call your trusted North New Jersey Power Washing Contractors at Softwash Ranger. Like Decks, Fencing can be cleaned and restored to its maximum potential with the help of out Fence Cleaning Professionals. 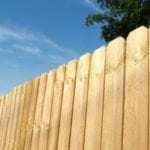 Our North New Jersey Fence Cleaning experts will professionally clean, wash and finish your vinyl fence to ensure you protect your investment. Call Softwash Ranger and see the difference we can make.